Volkswagen UK says it is experiencing “unprecedented demand” for its two plug-in models and has had to stop accepting orders temporarily for both the Passat GTE and Golf GTE until demand can be met. The Volkswagen UK website reads: “Due to unprecedented demand, leading to long delivery lead times, Passat GTE is currently closed to ordering,” and says the same about the Golf GTE. Still, Volkswagen would not confirm what causes those bottlenecks in production. The Golf is built in Wolfsburg, while the Passat is built at a factory in Emden, Germany. The e-Golf and e-Up! 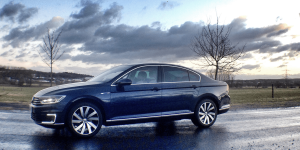 are still available to order, however reports from earlier this year also spoke of exceptionally long wait times, not only for Volkswagen but other carmakers as well. UK spec GTE models still available for order outside the UK. How can VW justify this potential breach of EU free market access legislation?